After 10 years with a well-established band in Eastern Ontario, Rob was relocated back to Woodstock in Southern Ontario. He immediately started recruiting the best players in the area for “Rob & The Rydells”. Each of the members of the Rydells has many years of experience in the music business, and a passion for 50’s & 60’s era Rock and Roll. 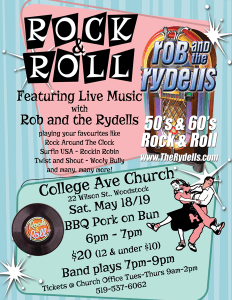 Rob & The Rydells will provide a fun-filled, family-friendly evening of dancing to those great Rock & Roll hits that everyone remembers like ‘Rock Around The Clock‘, ‘The Twist‘ and ‘Surfin USA‘. If you’re planning a fundraiser, special event, wedding reception or any other party where people can be on the dance floor all night, then please click the ‘Contact Us’ link. We would love to help make your event a success! PS. This band has a dress-code, so they look as good as they sound!